Thank you so much to those who attended and contributed to out 1st annual Ella Reese Foundation Car Show this past weekend. It was a great success! We had over 50 very interesting cars including Porsche, Alfa Romeos, Cadillacs, Lincoln Zephyr, Corvettes, Factory Five, and some very cool vintage vehicles. Live music was provided by Low Bid Band which was very entertaining. We had a great turnout and generous donors. We hope to do this again next year! Thank you to everyone who supported it. 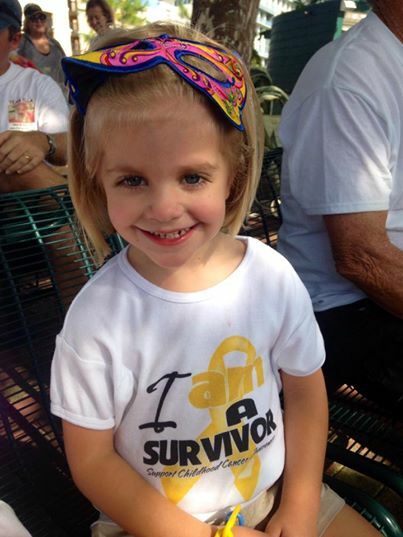 The Ella Reese Foundation was proud to promote Childhood Cancer Awareness at the Alfa Romeo Club Auto Show held at Celebration, Florida with the theme, “Pay Attention to the Little Things”. Club members donated their entry fee to our foundation. Thank you to all who participated! Thank you so much to our dear friends of the Ella Reese Foundation, those who donated generously and those who participated in our poker tournament. With the money raised, we were able to help this sweet boy Matthew pick out cool blue hearing aids that he will be receiving in the next few weeks! We are so happy for him! A sincere thank you to everyone who helped make this happen! Ella participated in Runway to Hope for her 6th year! She is now considered a “surivivor” and received a special survivor medal and escorted her very good friend Sophia. We thank all of those who attended the 4th Annual Ella Reese Foundation Poker Tournament on March17, 2018. It was a room full of generous players and terrific prizes donated by many loyal friends of the Foundation. The tables were full of laughter and good will and sometimes very serious bluffing. We thank everyone who made this year’s tournament a success. This past weekend we participated in the St. Baldrick’s Event and Brian “braved the shave”. This is a way to raise money for kids with cancer. Get sponsored to shave your hair. Ella was so proud of her daddy for shaving his head. This bold act of baldness has gained major momentum since it’s start in 2000. Just since 2005, St. Baldrick’s events have helped raise 234 million dollars for lifesaving childhood cancer research. Well, we proved that a Poker Run is a lot of fun! We thank all our volunteers and participants for joining us in our First Annual Poker Run. We also thank Johnny’s Fillin’ Station, the Silver Dollar Saloon in St. Cloud, the VFW Hall in St. Cloud, East Orlando Harley Davidson, and the Wing Shack for making the journey such a pleasant one for our participants. We also experienced the generosity of strangers who simply stopped by to give a donation. It was truly a wonderful day. This will be our first year doing this and should be a lot of fun! Come join us on Saturday, April 22 at Johnny’s Fillin’ Station! Hope to see you there! The Ella Reese Foundation participated in the Talia Joy’s Second Annual Pet Walk which supports childhood cancer and the pet therapy program at Arnold Palmer Hospital.Of course Ella loved this event because it involved her dog Simon.This is a picture from the event with her dog and her cousin Anna Kate.GO GOLD! September is Childhood Cancer Awareness Month.The Ella Reese Foundation participated in the Orlando Goes Gold Event where the Dr Phillips Center for Performing Arts, Coca-Cola Orlando Eye, and the Art Lighting in the city of Orlando went GOLD in support of pediatric cancers. Ella participated for the 4th year in RUNWAY TO HOPE.She got to walk the runway with Tinkerbell again, and her good friend and fellow neuroblastoma survivor, Sophia Soto.Runway to Hope’s mission is to provide direct support to Central Florida children and their families impacted by pediatric cancers. 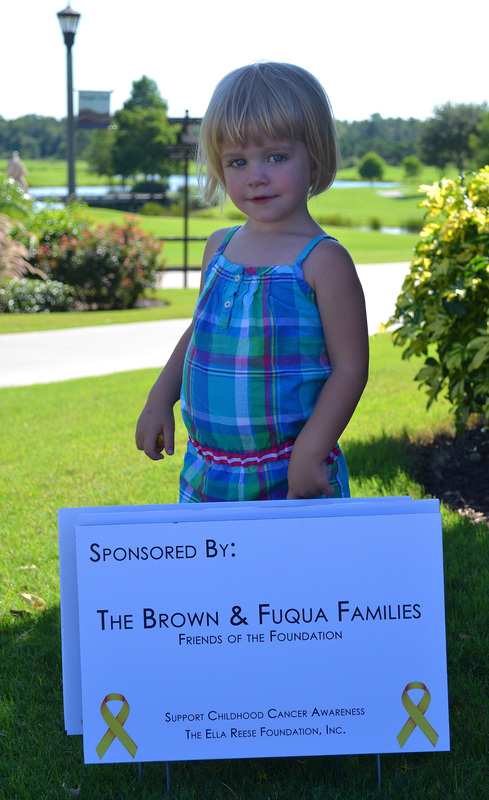 Thank you, thank you, thank you…..to all the generous donors, sponsors, players, and volunteers who joined us on Saturday, April 30th, 2016, for the 4th Annual Ella Reese Foundation Charity Golf Tournament at Shingle Creek Golf Course. It was a beautiful sunny Florida day, a perfect morning to enjoy a game of golf. Lunch was terrific and everyone enjoyed winning the raffles and prizes that were so generously donated by kind and caring people. We are so thankful for the support of everyone who participated in some way to make this an amazing event. 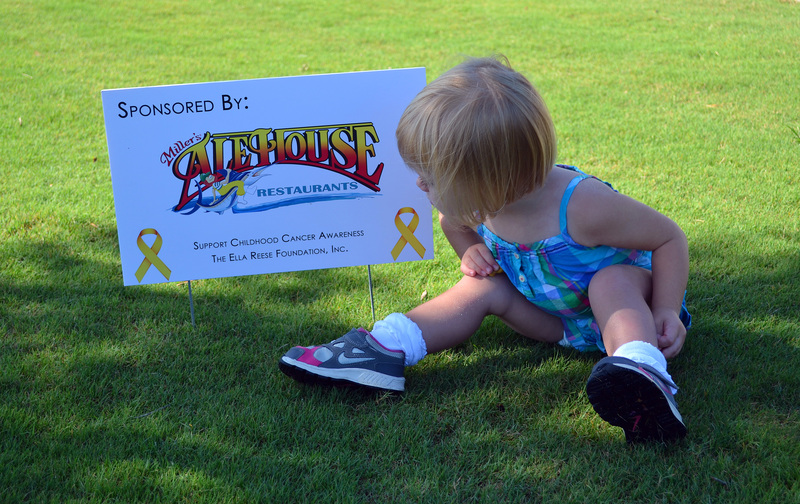 It is time to register for the 4rd Annual Ella Reese Foundation Charity Golf Tournament. 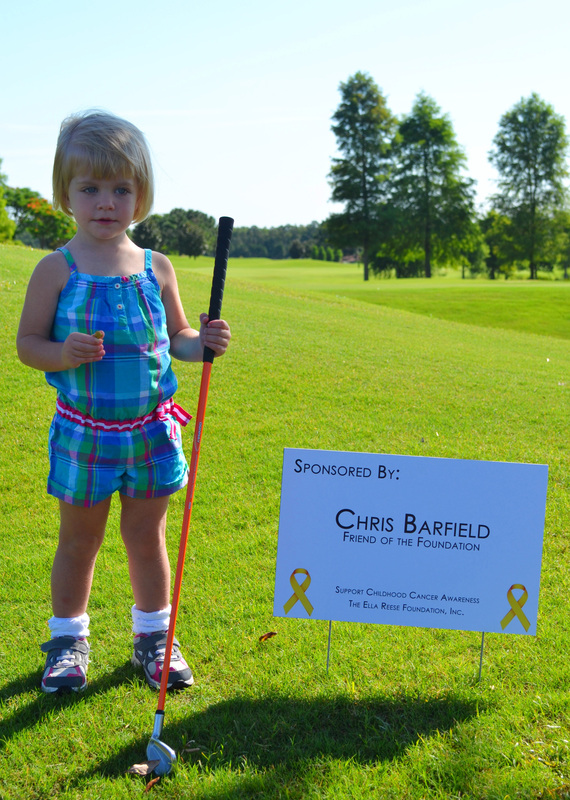 The Annual Golf Tournament is our primary fundraiser and provides us with the resources to live up to our mission of Care and Comfort to children with neuroblastoma and other childhood cancers. Thank you, golfers and sponsors, for making it all possible. We hope you can join us at one of the most prestigious golf courses in Central Florida, enjoy a wonderful lunch, and raise money for a great cause. NOTE: The first 24 golfers to register will win a special gift to be distributed at the luncheon. Use the attached Registration/Sponsorship Form to enter. You may pay by check, or go directly to the link,http://www.ellafightsback.com/give-a-hand/ to pay the entry fee or to sponsor the event using Paypal or your credit card. If you have any questions, please contact John at 407-864-2679 or email us at cile310@aol.com. A HUGE Thank You goes out to the team of Carl, Stephan, and Katie of Stand Up MRI for hosting their 1st Annual Golf Tournament at Shingle Creek Golf Course on December 4th, 2015. They chose our Foundation to be the recipient of their charitable contributions. Their kindness and generosity is overwhelming. The funds raised will be used to help renovate the Oncology Clinic Playroom at Arnold Palmer Hospital with toys, games, video products, paints and crafts, and many other items the hospital has provided on their wishlist. We are so happy to get started right at Christmas time. Thanks to all the sponsors and players who made the tournament such a huge success. THANK YOU – to all the players and volunteers who made the 3rd Annual Charity Poker Tournament a terrific success. We had a FULL HOUSE and we were ALL IN for a good time. Great prizes went to the top 10 players, and lots of ‘bounty’ prizes gave many people the chance to leave with something fun. Doc’s Streetside Grille was a perfect venue and we plan to return there for our next poker event. Keep in touch with www.EllaFightsBack.com so we can DEAL you in next time! All proceeds benefit The Ella Reese Foundation a 501C(3) Organization dedicated to the care and comfort of children battling Neuroblastoma. We are so thankful to all those who joined us at Shingle Creek Golf Club to play golf, enjoy lunch, and have fun with numerous raffles and silent auctions. The weather was terrific and the course was, as always, perfectly manicured. We want to thank the many donors who so generously sponsored the beverage carts, the tee boxes and the greens. And we extend a big thank you to our dedicated players who came to join us for a good cause. Our goal is to spread awareness about Neuroblastoma and the need to help families who are struggling with the fight against this deadly cancer. We are so very grateful for everyone’s participation and loyalty to our Foundation. Hope to see everyone again in 2016, and tell your friends to join us! 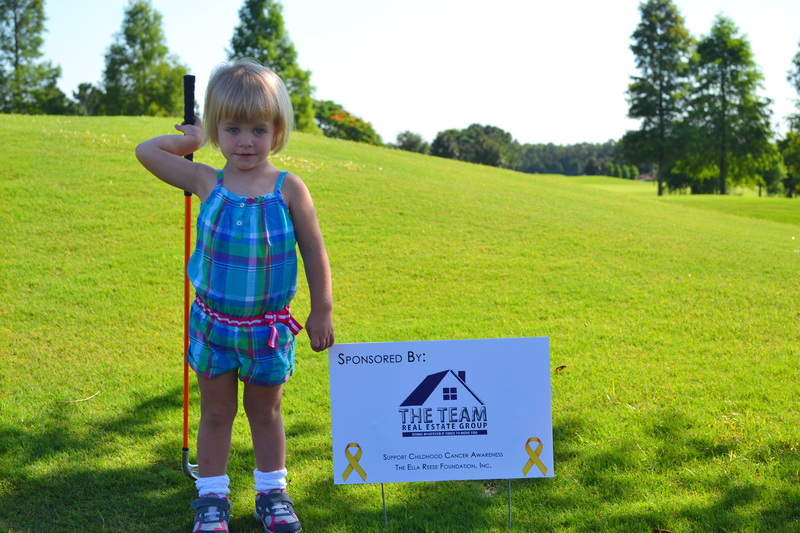 It is time to register for the 3rd Annual Ella Reese Foundation Charity Golf Tournament. 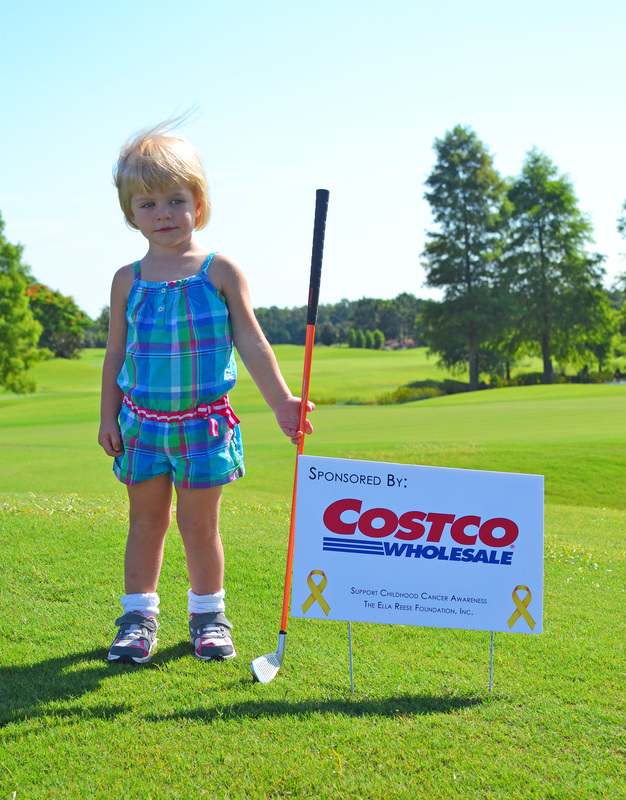 The Annual Golf Tournament is our primary fundraiser and provides us with the resources to live up to our mission of Care and Comfort to children with neuroblastoma and other childhood cancers. 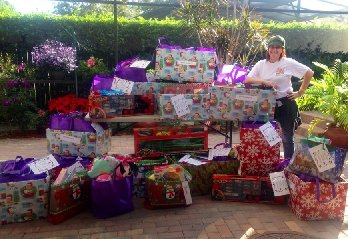 Last year, we were able to provide many children at Arnold Palmer Hospital with “Ella Cares Packages” filled with toys, gift cards, and necessities. We also supported their families with various personal and financial needs, and participated in the APH Christmas gifting program. Read more about us at www.EllaFightsBack.com. or go directly to the link below to enter or to sponsor the event. If you have any questions, please contact John at 407-864-2679 or email us at cile310@aol.com. We are looking forward to another successful event. THE ELLA REESE FOUNDATION, INC.
We want to thank everyone who participated in our fund-raisers this year, all those who made personal contributions to the Foundation, and those who found ways to raise funds among their co-workers and friends.Through your generosity and on your behalf, we brought much Christmas joy and financial assistance to those children and families faced with Childhood Cancer who are at the Arnold Palmer Hospital Oncology Unit. Many families need much more than presents for their children. They need funds to assist them in their daily lives. In addition, they need to know they are not alone in this fight. A visit of encouragement means so very much to them. They ask us to remember their families in prayer, so we pass that on to everyone and hope we can all honor that request.We sincerely thank you again for your generosity and love shown to these children. Hope to see you at the 2015 Golf and Poker Tournaments. Always know that if you can not participate, there are many opportunities to be a sponsor.Happy New Year! forward to 2015 when we will be ‘ALL IN’ again to deal the cards and enjoy the company of such loyal friends. on SATURDAY, NOVEMBER 1, 2014. See brochure below for all details. Refer any questions to EllaFoundation@aol.com. 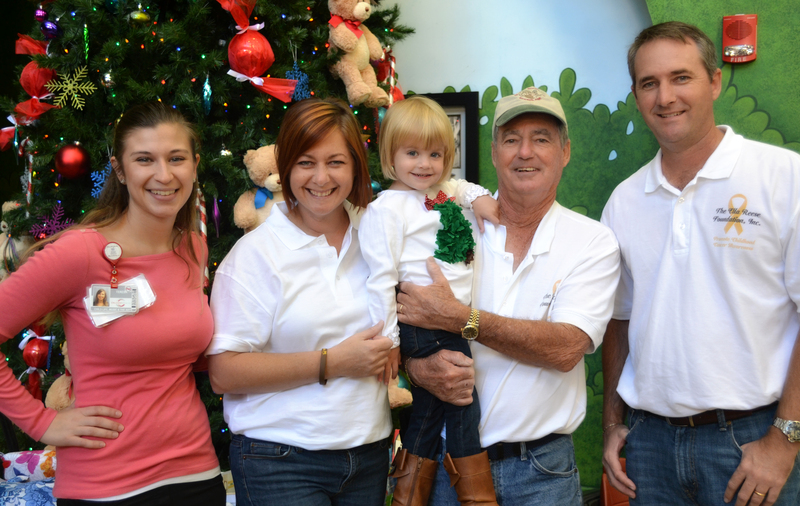 Last year we delivered over 100 Christmas gifts to the children fighting cancer at Arnold Palmer Hospital. This year we want to exceed that goal and also assist the families with other needs. And as always, we hope to spread Childhood Cancer Awareness to our community. 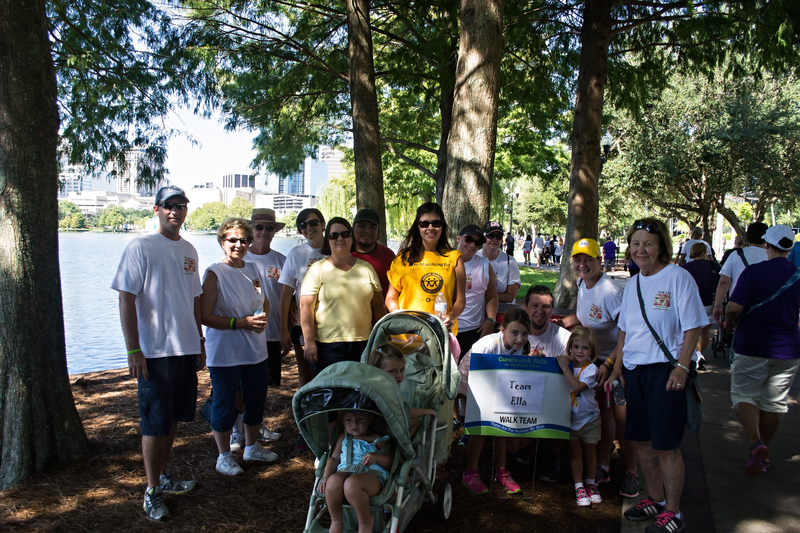 Thank you so much to everyone that attended the Curesearch event at Lake Eola September 13th, 2014. And a sincere thank you to those who donated to this cause. It was a beautiful morning and a great turnout! 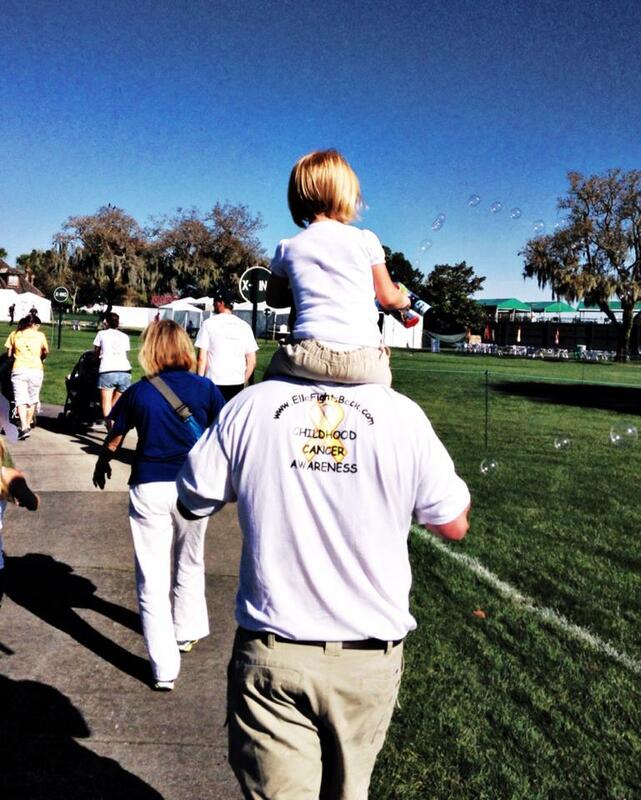 Love to see all those people coming together for the same reason…to find a cure for childhood cancer. WOW, what a perfect day! We had one of those beautiful May mornings, pleasant and dry, and a slight breeze. 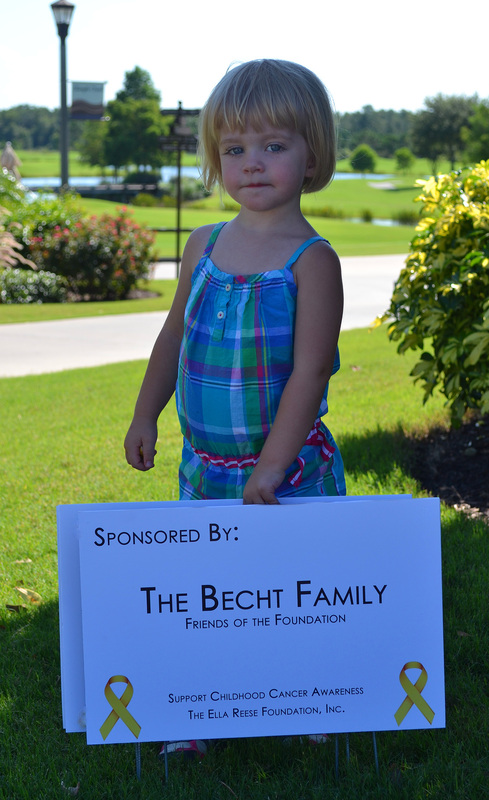 The golf course was filled with devoted supporters of our Foundation and the sponsor’s signs were prominently displayed at the tees and greens. We had an abundance of raffle items and silent auction items for our players to enjoy. The Shingle Creek staff treated us all like royalty. Every request was fulfilled with respect and urgency. It is simply the most beautiful course in Central Florida. We thank all our players, our donors, our sponsors, our dedicated volunteers, and Auggie Decker, Tournament Director at Shingle Creek, for making The 2nd Annual Ella Reese Foundation, Inc. Charity Golf Tournament a huge success. Now we begin to plan our 3rd Annual Ella Reese Foundation, Inc. Tournament for 2015! Sign up for our Second Annual Charity Golf Tournament on May 10th, 2014, at Rosen Shingle Creek. We have already secured some wonderful prizes and unbelievable raffle gifts in an effort to make this tournament even more fun than last year. So many participants stated our 2013 Tournament was the BEST they ever attended and want to return this year. 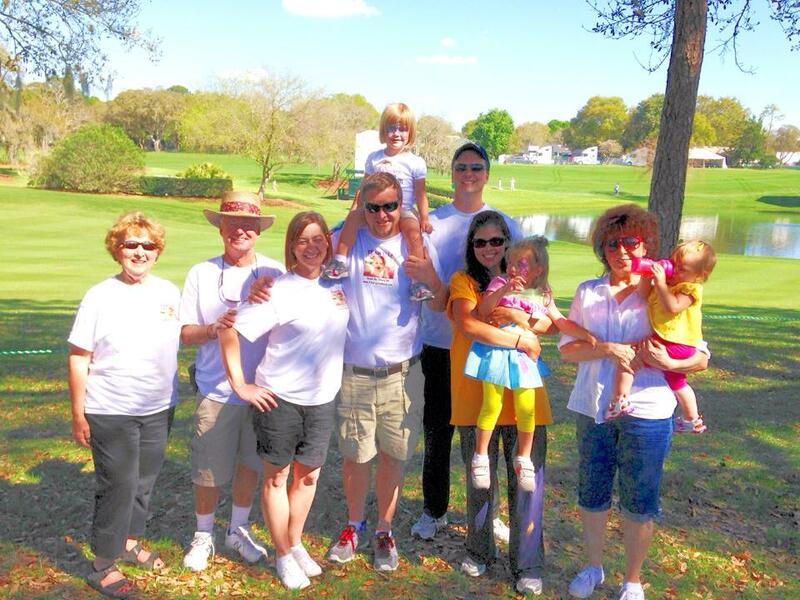 In addition to raising funds and enjoying the day, the Tournament gives us an opportunity to share information regarding Neuroblastoma and other childhood cancers. Funds raised at the event last year resulted in many gifts for the children at Arnold Palmer Hospital suffering treatments for Neuroblastoma. We were also able to fulfill special needs of the parents of these children. In addition to individual donations to the families, we delivered over 100 gifts to the Pediatric Oncology Department at Christmas-time. We find that even the smallest act of kindness brings so much joy to these children and we feel privileged that donations from the community allowed us to do that. So please join us on the course or consider sponsoring a hole or beverage cart. Thanks and hope to see you there! Registration form below! 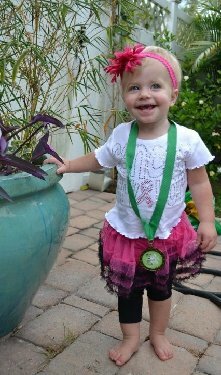 Thank you so much to those who donated to Team Ella for Arnies March on March 18th. All money raised went directly to Arnold Palmer Childrens Hospital Oncology and Hematology Floor. There were over 700 people marching and 1300 supporters that have raised over 160,000 dollars for children’s cancer research at APH. What a beautiful day and great turnout! I’m so happy that The Ella Reese Foundation could be a part of bringing happiness to the children at Arnold Palmer Hospital. 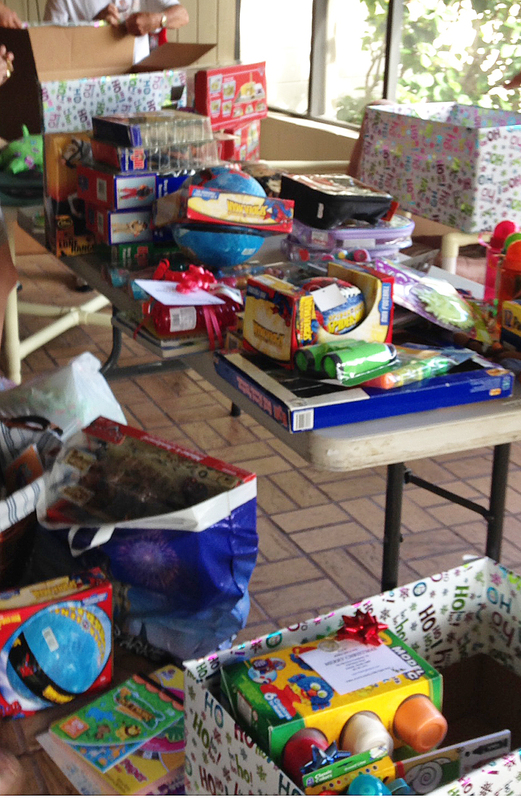 We were able to deliver over 100 Christmas toys to the oncology floor. Thanks to all the generous people who support this cause and helped to make this possible! Michelle and Brian attended their 20 year high school reunion on this date. Much to their surprise, it was announced that the proceeds from the event will be going to The Ella Reese Foundation! 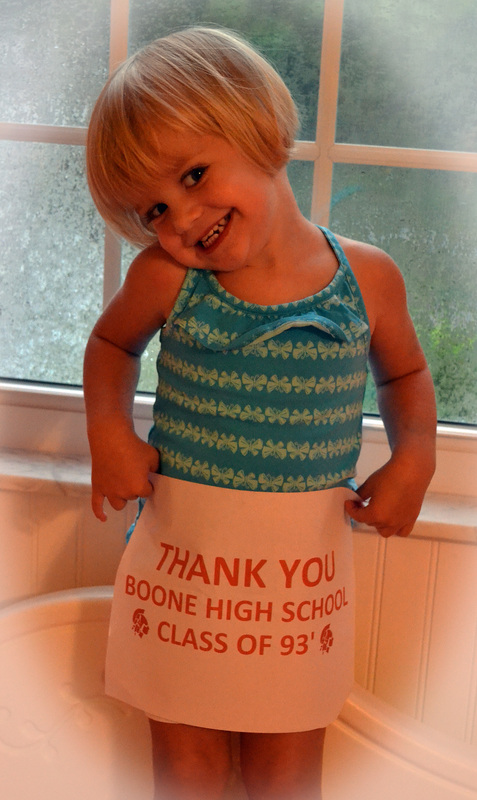 Thank you William R. Boone High School Class of 93!!! What a wonderful and successful golf tournament!!! God blessed us with a perfectly delightful day! Thanks to Rosen Shingle Creek for all they did to make it an enjoyable experience. It was a beautiful course and friendly staff, and the lunch was delicious. Thanks to all our players for coming out to support the Ella Reese Foundation. You all contributed to the success of this tournament. Thanks to all our donors for the huge amount of raffle items – values from $20 to $1200. Almost everyone left a winner. (Even our last place foursome won something). Thank you to Ella, who has, through her diagnosis of Neuroblastoma, brought our family into the world of childhood cancers. She has created a passion in us to help other families who hear the devastating words “your child has cancer”. Thanks To Arnold Palmer Hospital for approving our foundation to be an ambassador to those families of children diagnosed with Neuroblastoma who need support in some way. 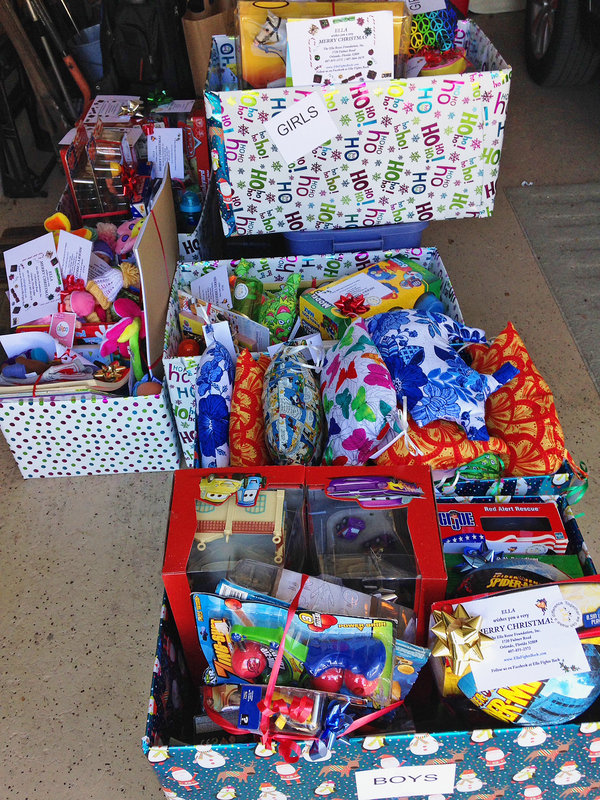 The community generously helped Ella and we hope to “Pay It Forward” to others in need. All the players requested to be included in next year’s golf tournament and plan to bring even more players to the event. Thank you, thank you, thank you. Join us at our inaugural Ella Reese Foundation Charity Golf Tournament. With your participation, it will be a spectacular event at one of the most pristine golf courses in Central Florida. Fill out the Registration Form and get your reservation early. ON SATURDAY, JUNE 29, 2013. Thanks to Mike Mortimer and his terrific group of poker players who joined in a tournament for Ella’s benefit. Thanks and appreciation go out to all of you. What a glorious day supported by such good friends and wonderful family members! 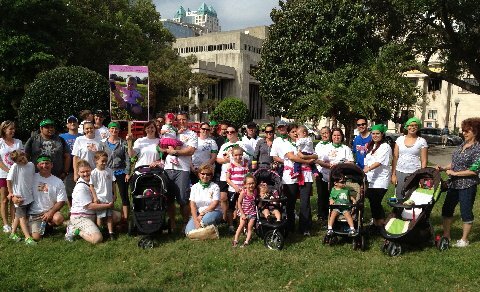 Thank all of you for supporting Ella in the CureSearch Walk at Lake Eola. The numerous children who join Ella in this fight were on stage beside her and made an indelible mark on the hearts of everyone who was present. Approximately 1000 caring people joined in this event and over $70,000 was raised. It is so important to raise awareness and support research to eradicate Childhood Cancers. It was an unforgettable experience shared with such kind people who love Ella and all children afflicted with cancer. Thanks to all who walked and all those who so generously donated money to the event. Thank you, thank you, thank you. 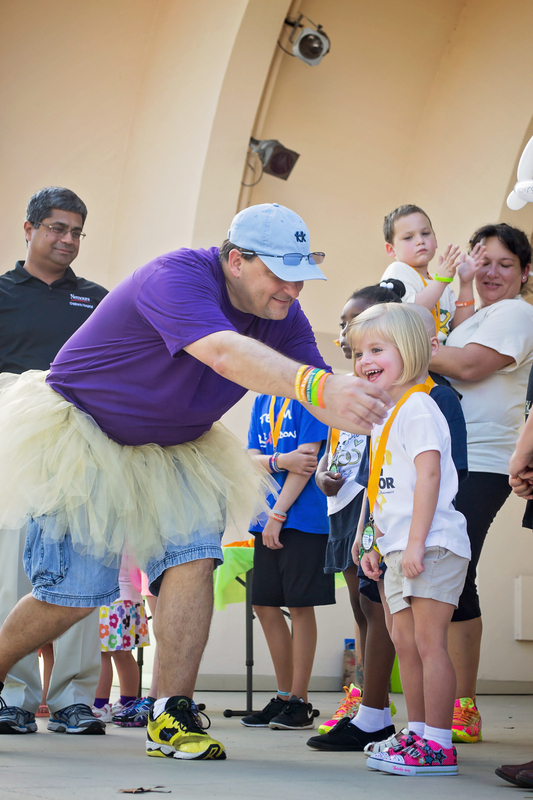 You are invited to join Ella and her family and friends in the CureSearch Cancer Walk on Saturday, April 14th at Lake Eola in Downtown Orlando.This is a time to celebrate and honor all children affected by cancer in the Orlando area. There will be music, food and activities for the whole family.All money raised goes to Children’s Cancer Research in hopes that one day children like Ella will not have to endure this horrible illness. Registration begins at 8am, and the walk starts at 9am. You may follow the link below to the main page of CureSearch Walk to register in advance, or you may register the morning of the walk. If you are unable to attend the walk but would still like to donate on behalf of Ella, you may follow the above link and select DONATE. Type in Michelle Reese as the participant and then follow the instructions to “Team Ella”. Thank you to all who have already contributed to this event and those who have signed up to join us. A huge thank you goes out to Thomas Cook Children’s Charity for their generous grant to the Ella Reese Foundation. The application for the grant was submitted by Ella’s Aunt Gina, who was associated with the local Thomas Cook Travel Group. The people at this office have shown such love, generosity, and dedication to Ella throughout this journey. The family is so grateful for this donation. Thank you, Gina, and all those associated with Thomas Cook in the US and the UK. The women of Avalon Park Moms and Tots held a garage sale accompanied with a delicious bake sale for Ella’s benefit. Thank You to all who participated and worked so hard to make this a successful event. Thank you Carla, Sandy, Valerie, Cari, Tracy, Tiffany, Crystal, Marcy, Kristy, Katie, and and Becky. A warm and sincere Thank You goes out to Bert Delvillano of the BMW Porsche Club of Central Florida and Chris Wells of the Martin Sports Car Club for supporting Ella at their annual racing events this past weekend at the Orange County Convention Center. Members of both clubs were so generous and showed overwhelming support for Ella’s cause. Thanks to all of the wonderful families who shared a perfectly beautiful day and became members of Team Ella. 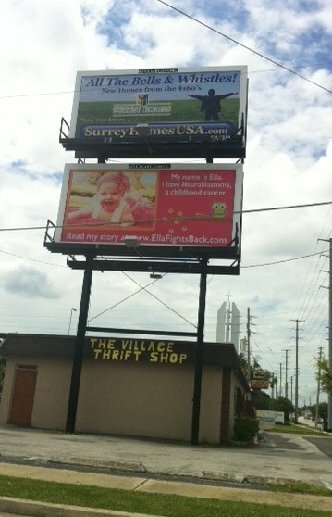 ELLA ON A BILLBOARD !!!!! Thanks to Christy and Nate Groover and the generosity of Clear Channel for providing three billboards featuring Ella and promoting awareness of Neuroblastoma. 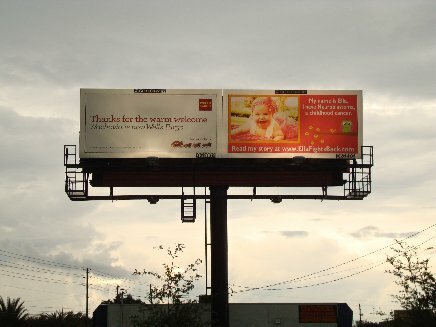 There are three billboards – Michigan Avenue, South Orange Avenue, and Highway 50 East. They are awesome! Thanks to Patte and her team of expert dealers and to everyone who attended the First Annual Poker Tournament for Ella’s Benefit on September 23rd, 2011. What a great turn-out! Everyone commented that they want to come back and try their luck again very soon. It was so much fun and full of generous, kind, and playful people. Thank you all so much. A big Thank You goes out to Dania Valentine who orchestrated a great Bowling Event on August 21st at AMF Bowling Lanes. There were plenty of strikes and spares and they all paid off for Ella’s Foundation. Thanks, Dania, and everyone who came out to support Ella’s cause. What a beautiful, successful, and fun-filled event! A group of wonderful young mothers, who understand the heartfelt pain of caring for a seriously ill child such as Ella, has become one of the many miracles God has sent the family through this journey to fight Neuroblastoma. They planned the lunch/raffle event with heartfelt love and enthusiasm securing marvelous prizes that enticed everyone to take a chance to win. The beautifully decorated Community Center at St. John Vianney Catholic Church was filled with smiling children who were entertained by face painting clowns, balloon animals, Elmo, firemen, arts and crafts, and singing by Mr. Richard. The families were fed well with yummy spaghetti and delicious sweet treats at Ella’s Sweet Shop. All enjoyed the fantastic raffles and the comradery of the community. Many were happy to have won the prizes they selected. Others did not leave feeling as though they lost. They expressed the feeling that Ella was the Winner today. What a wonderful coming together of God’s children. The family is so very grateful to Team Ella and all the generous donors of prizes and supplies. Thanks to the Pastor, Father Miguel, who graciously allowed us to use such a powerful venue. Thanks to the Knights of Columbus from St. John’s who cooked, and cooked and then cooked some more until the record number of people were fully satisfied. Thanks to the hardworking, cheerful volunteers who worked tirelessly to make this event so upbeat and successful. Over 700 people attended the event and witnessed how love is expressed by strangers who all have the same goals – loving every child and ensuring that families are supported when faced with such a tragedy. Thank you for joining us on a beautiful Sunday afternoon dedicated to Ella allowing us to promote awareness of childhood cancer such as Neuroblastoma. May God continue to bless each of you for supporting Ella Fights Back. Thanks to all the residents and friends at Southland Suites for the very successful bake sale they held to benefit Ella on July 27th. Everyone was thrilled with the delicious sweets and a good time was had by all. WHAT A WONDERFUL RESPONSE TO THE GARAGE SALE on July 16th! Our thanks to all those generous people who donated so many useful and beautiful items that many in the community are now enjoying. Remember, one person’s trash is another’s treasure. Thank you to all the volunteers who worked so hard in the heat to make this event such a success. And a big thank you from Ella! God bless you. We are excited to attend this event and looking forward to help out in any way we can! My name is Courtney — I put out your business cards today at Girlie Girl Things. My sister and I bake cupcakes and would love to donate some to the spaghetti lunch event! Not sure if you already had dessert or something sweet lined up, but we’d love to help if you need it! Let me know at my email – cordyjay@comcast.net ! That would be great! We are also having a bake sale at the spaghetti dinner/raffle event so certainly we could use some cupcakes! I can get them from you somehow the day before the event! Maybe meet up at the store?